It does not happen often, but sometimes it seems that Amazon only lists new Tolkien related books after they have already been published. 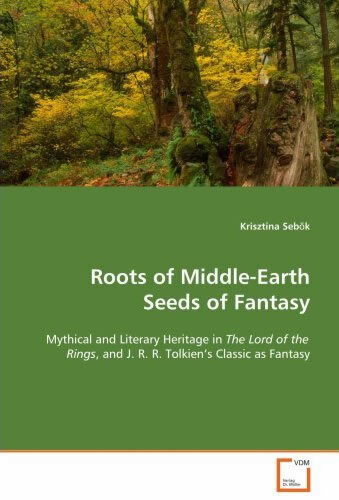 Today I noticed a thin book of 72 pages with a very long title, Roots of Middle-Earth Seeds of Fantasy: Mythical and Literary Heritage in The Lord of the Rings, and J. R. R. Tolkien's Classic as Fantasy. This book was published in October 2008 and only now showed up on Amazon. While this book only has few pages it seems very interesting none the less. It is written by the Hungarian Krisztina Sebok. She was born in 1979 in Budapest. It was during her university-years that she first met Tolkien's works. This masterpiece of Tokien opened up the door to the world(s) of fantasy, to which Krisztina first became a reader and admirer, then a critic and a collector. The first thing I did was getting in contact with her and am now convinced this book is indeed something I want to read. I'll be releasing a small interview with the author in a few days time. "The Lord of the Rings has evoked serious debates among practically all levels of literary society from mere reader to literary critic, tutor to biographer, devoted admirer to simple imitator. J. R. R. Tolkien's masterpiece has been provoking endless disputes about the possible literary origins of its elements, just as well as about the literary category with which it may be characterise, since it was published . In this work, the reader may discover the way and the extent to which certain character-level elements of the literary affiliates of myths, legends and fairy-tales effected the creation of such important characters in Tolkien's classic as Dwarves, Elves, Hobbits, and Wizards. Besides, the most prominent features of The Lord of the Rings based on which this book can be characterised as fantasy will also be presented, together with a comprehensive description of this literary mode."